Labels on show were Trashe, Erica Hackell Design / Minnie Dean and David Roil’s Freak wear. 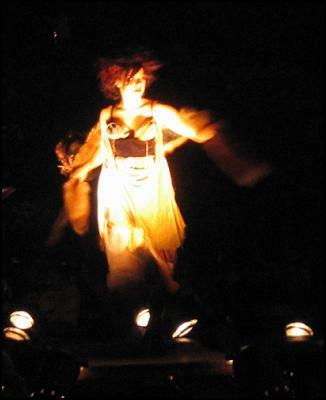 Initially this show was to be staged in the Bolton Street cemetery. Although the venue changed to the Soundshell, the organisers must have felt that "Freakin’ at the Botanical Gardens" wouldn’t have quite the right resonance. There were some distracting venue-related problems with the lighting and sound. The fixed and slightly yellowish spotlights tended to flatten and dull the sharp black and white clothing contrasts. There were a few problems with the sound system too: MC Rodger the Dodga’s voice occasionally jarred, with an electronic burr to the plosives. At least his mwah-mwah-mwah laugh still came through nicely, as he jollied the show along and reminded the audience how exciting and daring it all was. Along with the actual display of clothes the show included a sampling of ‘freak’ entertainers. There was a bird troupe who formed a small brightly coloured lek, a powerfully-voiced singer (Miss Cherry Gemstone), and a pleasingly substantial belly dancer (Leilah). As well, a little inexplicably, there was a replay of a 20/20 documentary about the mysterious death of the mother of David Roil. The fashion was everything you’d expect at the baroque end of Goth - ornate trailing gowns, generally bustled and sometimes caped, in a colour palette mostly limited to black, white and grey. The hair was great and the make-up dramatically eye catching. Some models went with the quirky zombie-doll walk, others glided, eerily smooth undead princess style. The crowd-pleasing male models, all of whom had thoroughly mastered the art of walking in long skirts, simply strutted.